The Energy Access Project at Duke University (EAP) is a new research and policy effort that aims to address the challenges around increasing access to modern energy solutions to underserved populations around the world. We take an interdisciplinary approach to developing sustainable, modern energy for all. Established in 2017, the project supports foundational research and fosters constructive dialogue among the world’s policy makers, entrepreneurs, and scholars to identify ways of applying that research. Key collaborators include the Nicholas Institute for Environmental Policy Solutions, the Duke University Energy Initiative, the Sanford School of Public Policy, Bass Connections, and the Nicholas School of the Environment. 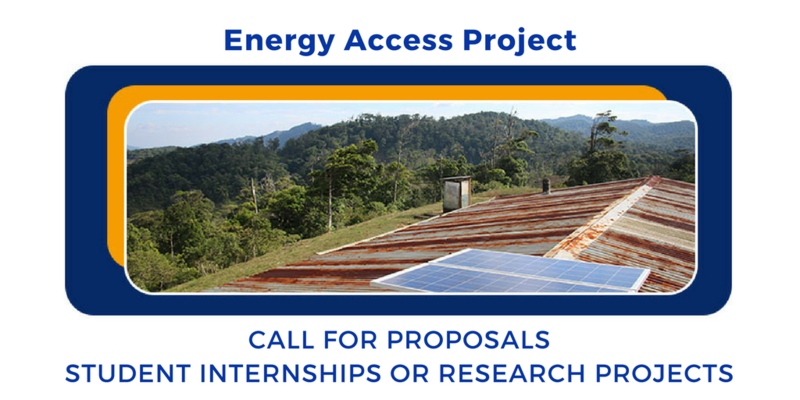 The EAP invites proposals for student internships or research projects in Summer 2018 related to energy access in less‐developed countries, with a focus on either modern technologies and fuels for cooking, or access to reliable, affordable, safe, and sustainable electricity. The EAP is particularly interested in internships or projects that (i) promote innovative approaches to accelerate sustainable energy transitions in less‐developed countries; (ii) offer insights that are applicable or generalizable to wider audiences; (iii) help to close the know‐do gap between academic researchers and public and private practitioners; and/or (iv) are related to ongoing research or research interests of Duke faculty. Undergraduate and graduate students at Duke University who are currently enrolled, and will be enrolled full‐time at Duke in Fall 2018, are eligible to apply for up to $5,000. While funding is available for a variety of experiences including internships or research projects, we will prioritize proposals that identify a sponsoring organization that the student has established contact with and secured logistical and institutional support from. We will prioritize proposals for internships or research projects in the field (i.e., in less developed countries with communities that directly experience energy access challenges); however, we will also accept proposals for internships or projects based at Duke, or in other parts of the developed world. While the EAP recognizes that energy poverty exists worldwide, including in developed countries, at present we focus exclusively on less‐developed countries. If you are uncertain if your setting is included, we encourage you to contact us before applying. Proposals must be submitted electronically (MS Word preferred) to rob.fetter@duke.edu by 5:00 pm (EST) Thursday, March 8, 2018. Proposals submitted after this time will not be considered. Description of the project or internship. This section should be reasonably well detailed, and should include specific responsibilities to the extent you know them. If the experience includes field work, please also indicate how long you intend to stay in the country, and where specifically you will be (in one city, traveling to communities, etc.). How your proposed project or internship contributes to the priorities of the EAP, as noted in this call for proposals and on the EAP website. If you believe your project or internship relates to ongoing research or research interests of Duke faculty, please identify the relevant faculty member(s) and describe how it relates to their research program(s). What other funding sources you have applied or intend to apply for, including amounts you have already secured. (For undergraduates, please indicate if you have also applied to Duke Engage; if not, please explain why not). Questions or clarifications may be addressed to Rob Fetter, Senior Policy Associate at the Nicholas Institute: rob.fetter@duke.edu.